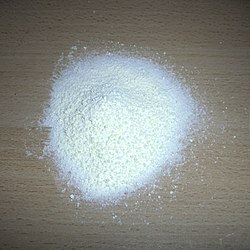 Powder is very small, dry pieces or grains. When we press some dry solids very hard, or when we cut something up into lots of small pieces, we can sometimes make powder. For example, people sometimes put face powder on their faces, when they want to look good. Sometimes sports players put powder on their hands, to make them dry. We put curry powder in our food, to make it taste stronger. We put washing powder in the washing machine when we want to have clean clothes. People use gunpowder to make bombs and fireworks. To powder is also a verb: Mary powdered her face. When a person says "I am going to powder my nose" they usually mean that they are going to use the toilet (US English: use the bathroom). This page was last changed on 7 March 2013, at 20:27.